Jose Offerman has been suspended indefinitely today for going wild during a minor league game last night. 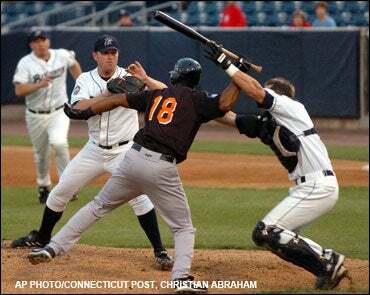 The former Red Sox infielder hit the opposing pitcher and catcher with his bat after he got hit by a pitch. The catcher sustained a concussion and the pitcher has a broken finger on his non-throwing hand. The 38-year-old Offerman has been charged with two counts of second-degree assault and is free on $10,000 bond. His next court date is Aug. 23. The independent Atlantic League hopes to make an announcement regarding the length of Offerman’s suspension by the end of the week. Offerman, playing for the Long Island Ducks in the Atlantic League, homered in the first inning. The next inning, he was hit by a pitch from Bridgeport Blue Fish starter Matt Beech and charged the mound with his bat. Offerman hit Beech in the hands and struck catcher John Nathans in the head. The Connecticut Post reported that Nathans suffered from nausea, Bluefish lefthander Mike Porzio said. Police said Beech, according to the Post, had a broken right middle finger. “It was just a scary incident for everybody witnessing took place,” said Porzio, who according to the Post signed a witness report after the attack. “Everybody was in shock at the time because it’s not something you see. I’ve played 15 years and I’ve never seen that before. 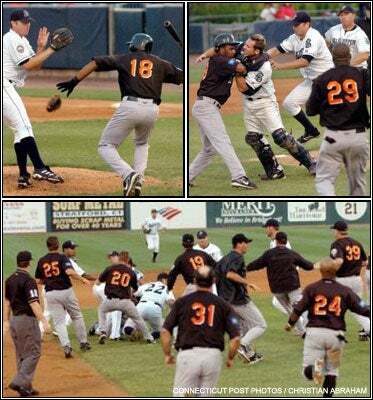 The game was delayed for about 20 minutes because of the melee. Offerman, Beech, and John were all ejected. Offerman batted .273 during his 15 seasons in the majors. He last played in the majors in 2005 with Philadelphia and the New York Mets. He was an All-Star in 1995 with the Dodgers and 1999 with Boston. Former Red Sox outfielder Carl Everett is one of Offerman’s teammates on the Ducks. Information from the Associated Press and the Connecticut Post was used in this report.